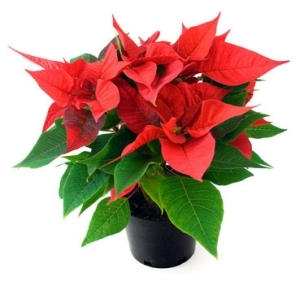 The poinsettia (Euphorbia pulcherrima), known as the Christmas Flower is one of the most popular plants for Christmas giving and indoor holiday decoration, sold by florists, available at garden centers and even in supermarkets. A medium sized shrub native to tropical America, it can be found growing wild in Florida, Mexico, the Bahamas and other mild temperature regions where it can attain heights of 8 feet and more. The flowers are inconspicuous pea-sized globes surrounded by colored bracts. It is those bracts that give the appearance of large starburst shaped flowers. Red is the most popular color, but there are also white, yellow and pink varieties. The flowers have no noticeable fragrance. Poinsettias make excellent screen or background plantings in frost free areas. They will freeze if temperatures go below 32, but will come back if frost is not too severe. They prefer a sunny location and rich, slightly acid, well drained soil. Kept reasonably moist, poinsettias are fast growers and heavy feeders. They can be trimmed several times during the growing season to encourage bushiness. The last pruning should be done in early September. Fertilize once a month during spring and summer with a 20-20-20 granular fertilizer - more often if using a water soluble product. Be sure to select an area for planting that does not receive any artificial light during the night. About two months of complete 12 hour darkness is required to set bloom. Propagation is by tip cuttings after the flowers have faded in January or February. Cuttings can be started 3 to 4 to a pot or placed directly in the ground. This also coincides with the first pruning of the year when plants should be cut down to about 10 to 15 inches to induce branching. You can also take cuttings of new growth in April or May. If you live in a colder climate and have aquired a poinsettia plant during the holidays, you may be tempted to try to keep it. It can be done with a lot of work and dedication, repotting, fertilizing and keeping to the required short day photoperiod. Better to leave the growing of potted plants to the experts and enjoy their superior products by purchasing plants for the holidays.